Discover the biggest selection of Christmas Sheet Music and Christmas Carols PDFs on the web, for all instruments and ensembles, with play-alongs. Pick your instrument, skill level, and collection to enjoy our extensive Christmas offering of over 3,000 carols available from over 260 different high quality digital sheet music collections by Virtual Sheet Music®. If you wish to print them out or download them as PDF files as well as downloading the included audio files and accessing any included accompaniment file, please add your selected item to your cart and proceed to the checkout to buy it, or Become a Member to download everything for free. Merry Christmas! 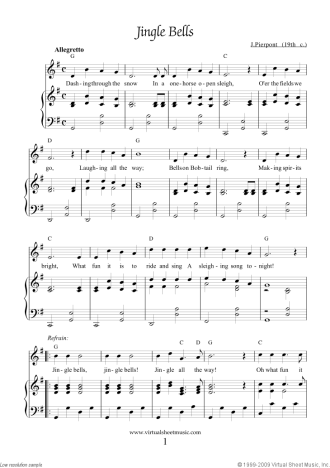 Top Quality, printable Christmas sheet music to download instantly. New collections will be published soon. Be sure to join our Mailing List to be notified when they will be ready for you. If your instrument or ensemble is not listed on this page, we can consider to prepare a Christmas Collection for you! Just Make a Request. Thank you! collection for voice & piano (or other instruments). collection for violin & harp. collection for violin & viola. by Joseph M. Martin for choir (SATB: soprano, alto, tenor, bass). Piano accompaniment video performed by Lisa Maresch. Piano accompaniment videos performed by Lisa Maresch. Do you have any questions or requests about the Christmas music repertoire, the Christmas genre in general, or just a comment about this page? Please, post your thoughts in the field below, our community members and supervisors will be happy to get back to you right away! Thank you so much for providing me with the much needed Christmas music. I love that you have parts for my string players and horn section. This year I am adding recorder players! I work with a small group from my church. I appreciate your services. Very clear sheet music, easy to read. Thank you Jan, glad to know you liked your music and that was easy to read. Have a great time playing it! Thank you Nancy for your nice comment, I am so glad to know our music helped you so much! Please, let me know if you have any questions or suggestions, I'll be always glad to hear from you.